After protests and occupations temporarily shut down ICE offices, Donald Trump suffered a significant political defeat when he was forced to reverse himself on separating immigrant children from their parents after they were arrested at the border. By and large, people were horrified at the separation of kids from their families and at the creation of what were basically prison camps for children. Polls showed that only about a quarter of the U.S. population supported Trump on this child-hostage policy, though about half of Republicans did. Trump thought no amount of hate and slander directed at immigrants—especially racialized ones—was too much, but it turned out there was a political limit. His efforts to present this as some type of quasi-normal use of leverage to force Democrats to pay for his wall fell flat. Those who had seen photos of children confined in cages had trouble viewing the policy as a negotiating tactic. While we are encouraged to see Trump defeated by the actions of numerous people who surrounded ICE offices, sometimes overnight, demanded #AbolishICE, and flooded airports in order to sing “Cielito Lindo” and show solidarity with children being flown across the country, the horror is not yet over. The government has lost track of many of the children it has shipped to shelters thousands of miles from where they and their parents were seized. The authorities in charge of this vicious operation did not bother to keep careful records of which children belonged with which parents, and some are too young to know important details. There is now press and popular discussion of how some children may never be reunited with their parents. In addition, Trump’s executive order, as usual, is not what it seems. It opens the possibility of imprisoning thousands of immigrants and their children on military bases, and it attempts to weaken the Flores v. Reno settlement, which limits child detention. We have had impressive examples of resistance to the Trump presidency, from the J20 inauguration arrests to the Women’s Marches, from Black athletes “taking a knee” to the #MeToo movement, and from the West Virginia and then numerous other state teachers’ strikes to the 40 days of action by a new Poor Peoples’ Movement. And while it is clear that the socialist left is growing, as witnessed by the growth and transformation of DSA, it is also clear that we do not yet have the kind of social power and political movement that will be necessary to stop Trump and the right, nor to even discipline the Democrats who, though they are once again being challenged internally and externally by sectors of the left, continue to prove their loyalty to the capitalist status quo. While we are inspired by all these efforts, we insist that there is a need for more and sharper class struggle. Therefore, we begin this issue with two accounts of recent class struggle, one in the United States and one in Brazil. Lois Weiner shows us what we can learn from the recent militancy of the teacher walkouts in order to build new strategies for working-class struggle, and Rebecca Tarlau writes about how and why the Landless Workers Movement provides a measure of cautious optimism in post-coup Brazil. We also look back to the radical history of 1968 for inspiration, to when uprisings occurred across many parts of the world, including the United States, France, Czechoslovakia, Mexico, and Senegal, among other countries. These uprisings showed the unpredictability, the possibility, the power and potential of radical protest movements. 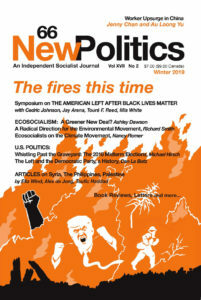 To show the fire at that time, we reprint two articles from earlier issues of New Politics. Martin Oppenheimer’s article was originally published in 1988 as a 20-year look back at 1968, while Richard Greeman’s 1968 account provides a participant’s view of the Columbia University rebellion, a rebellion that can now be seen as a warning of the gentrification to come and thus of the need to engage in socialist theory in order to guide effective socialist praxis. Left social movements have historically engaged with radical critiques of society and socialist theory. In this issue we pay attention to the history of, and the need for, theoretical discussion. Kevin Anderson reviews Raya Dunayevskaya’s book Marxism and Freedom, published sixty years ago, and assesses its significance today. Michael Hirsch tries to help contemporary socialists navigate the always challenging relationship between reform and revolution. And Bryant William Sculos uses the issue of gun violence and the opposition to it to look at the relationship between pacifism, liberalism, and socialism. We also have two articles that continue this tradition of critique by looking at the conditions of two major American cities and why they have both been at the center of protests in the last few years. Anthropologist Nicole Fabricant interviews Dr. Lawrence Brown on how Black communities have sought to heal themselves from the violence and trauma of segregation, poverty, and policing. Meanwhile Mathieu Dubeau and Lee Fiorio describe the social-economic conditions that could lead to an increase of class struggle in Seattle. While we know that current problems didn’t start with Trump and won’t necessarily end when he leaves office, some writers in this issue look at problems that preceded the current administration. Rick Baum shows that the devastation of inequality grew during the Obama administration, and Chris Wright offers striking examples of the relationship between alienation and technology under capitalism. No vision of socialist or transformative social change can support illusions about authoritarian leaders at home or abroad. There exists a misguided and dangerous tendency, currently being displayed concerning Syria, to excuse certain heads of state. Clay Claiborne reminds us of just what Muammar Gaddafi’s regime in Libya, particularly in terms of racism and immigration, actually looked like so that we can build an actually effective anti-imperialism. As always, we have our Words & Pictures feature, with Kent Worcester surveying some recent graphic novels, in particular one on the Syrian civil war by Molly Crabapple and another on the young C.L.R. James. And we have our book reviews, this time looking at four new works on American socialist history, Bernie Sanders, class, and labor in the South. As we send this issue to the printer, our minds are on the millions of children who suffer, whether in Palestine, at the border, or in American prisons and schools, and we are saddened, we are angered, and we recommit ourselves to the fight against right-wing and racist policies and institutions and to the struggle for socialism from below. La lucha sigue! !